The collecting of those military issued Colt revolvers which were used by the U.S. Cavalry during the Indian Wars, and their counterparts the "Artillery" revolvers which had been issued to the troopers of the Spanish American War, have today become one of the "hottest" areas of Colt collecting. 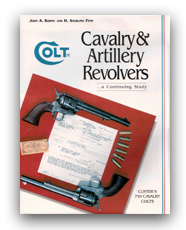 Those Cavalry revolvers which may have some remote connections to the U.S. Seventh Cavalry have intensified in popularity and their values skyrocketed. Today's collector is now able to tap into several outstanding resources on which to establish the necessary information required to successfully pursue his dream or owning just one "Custer Colt." This book has thru the years become one of the best resources available for the student-collector on which to build his collection. 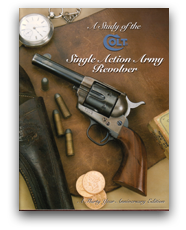 Many provocative areas are covered, including; "The Ainsworth Cavalry revolvers"; "The 1875 Ordnance Sub-Inspected Models"; "The Colt Artillery Revolvers"; "The New York Militia Revolvers"; "Condemned, Overrun, and Buy-back Revolvers", but by far one of the most relevant chapters for today's collector is; "The Fakes, Facsimiles & Frauds." Eighteen chapters alone delve into finite detail on these "U.S." inspected Colts. Along with the above, we have been the most impressed with the fourteen chapters which were written by the outstanding military historian, the late Dr. H. Sterling Fenn. These chapters deal in detail with the "Custer" or Seventh Cavalry issued revolvers. 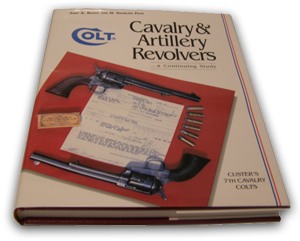 Many known "Custer" associated revolvers are illustrated and specific serial numbers provided. Probable serial number ranges are detailed. Hard bound, over 300 pages, colorful dust jacket. Order your copy today! We accept charge cards for DOMESTIC US ORDERS ONLY thru PayPal. For MAIL ORDERS you can mail your check payable to John Kopec Publications to the address listed below. Please add your shipping cost listed below, California residents need to also add 7.5% sales tax, to their MAIL ORDER.